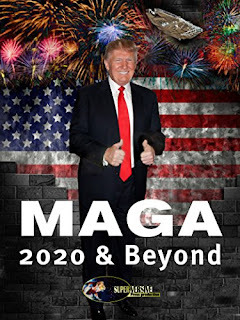 A Pius Geek: MAGA: Why Trump? After last year's election, I had the attack of the psychotic Leftists attacking me. The following is a comment I made back then. I didn't realize it was a whole essay. But now that MAGA 2020 has come out, I thought it was time to have this discussion. Yes, it's about politics. Because how can you avoid it? By the end of this, you will have to comment to tell me if the headline was clickbait. Perhaps this is less a matter of "Why Trump" and more a matter of "Anybody But Leftists." Obviously, some of the observations I made at the time have become invalid. As I said then, one of the biggest things against Trump was that he switched parties to become a Republican. I think people should be forgiven their mistakes when they as for it. "Every slander said about Trump has been said about almost every Republican nominated since 1980, if not 1960. (Look up Barry Goldwater sometime. Especially Johnson's campaigns against him.) Reagan was going to lead us to nuclear devastation. George Bush the first was supposed to be too stupid to know anything. I don't think I even need to go into everything said about George Bush the younger. And of course there was McCain. And Romney. I can show you some very interesting anti-GOP ads. And know the exact same thing is being said about the exact same political party's candidate. And the same exact people are having hissy fit. The same exact people are faking swastikas and lynching nooses. "Look up every single incident for the last 20 years about supposedly racist threats. You find that they are faked by a Democrat. Though in the case of vandalism against one's own church / temple / et cetera it is typically a member of the congregation. The same exact people are threatening violence again. Democrats. Every time Democrats lose, it is the electoral college is at fault. Because they would rather have 5 particular sections of the country rule over every other section of the country. "These people born me. With the threats and their swearing and the calls of nazi-ism, racism, mysogyny, homophobia, transphobia, phobia phobia. "While their side of the aisle seems to be scared of anyone armed with anything more than a plastic butter knife. Democrats say to call the cops, you don't need to gun. Then they say the cops are evil and racist and then ... in which case, why are we calling them? "At the end of the day Democrats, liberals, SJW's, are all boring. Repetitive. Frankly, if you want to fight an author by telling their readers what the author believes, you should do something as radical as look up the author, read their blog, because for all you know, the readers already know because the author has it plastered all over their blog. "My general disdain for Trump stems from his history of basically being a Democrat. That is the only regard in which I would believe that he was a member of the Klan. After all, the Klan is a Democrat party institution. Just asked Robert Byrd. Though I gotta tell you, Vs Hillary, everyone short of a serial killer looked more interesting... or at least like a better option. "Okay Gary Johnson look like a complete moron, but what can you do? "Though to be honest, I was more of a Ted Cruz person. Though I am relatively sure that everybody protesting in the streets right now would be bitching about him as well."